Me on the Sette in front of Kaui. Also part of the mission is to collect data such as conductivity for measuring salinity, temperature, depth, chlorophyll abundance. Seabird sightings will also be documented. 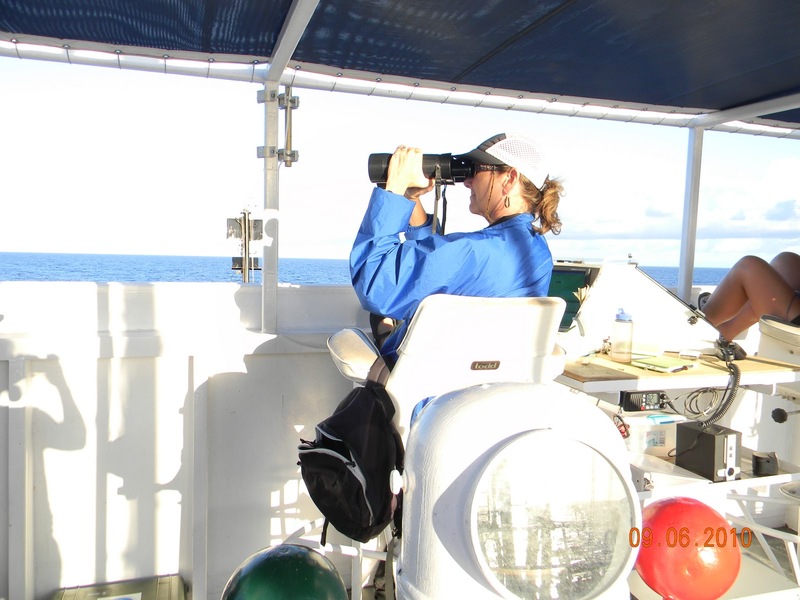 Locating whales and dolphins is a science in itself! It takes great patience and experience to know and be able to recognize the signs of marine life. Birds play an integral part of this “game” of locating marine mammals. Ed Bali, one of the observers with 31 years of experience tells me to look for the food. Where there is food, there are animals. Today they have not seen much of any life. So I remember what Ed said no food, no birds, no birds, no large animals. Yesterday was a big bird day. 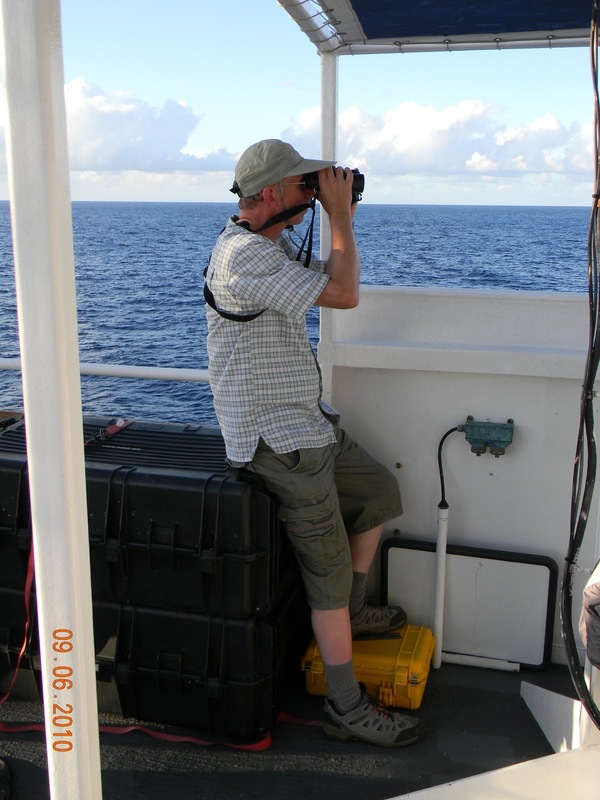 Scott, a Bird Observer, showed me the difference between the types of seabirds we were seeing. Of the 9,000 different species of birds in the world, only 260 are seabirds. Those seabirds are categorized into four “groups” called orders. We saw birds from three of the four orders. Scott Mills is an avid birder and lover of sea birds. I have learned a lot from him. Birds in the order Procellariiformes, commonly called the tubenosed, have a special desalinization system. They have a nasal gland with many blood vessels that filter out the salt from the blood. The reason the salt is in the blood is because they drink salt water while flying long distances over the ocean and also because the food they eat is salty. In most birds of this species the concentrated salt water from the nasal gland drips out of the tube which is located above the nose, and drips down their beak. 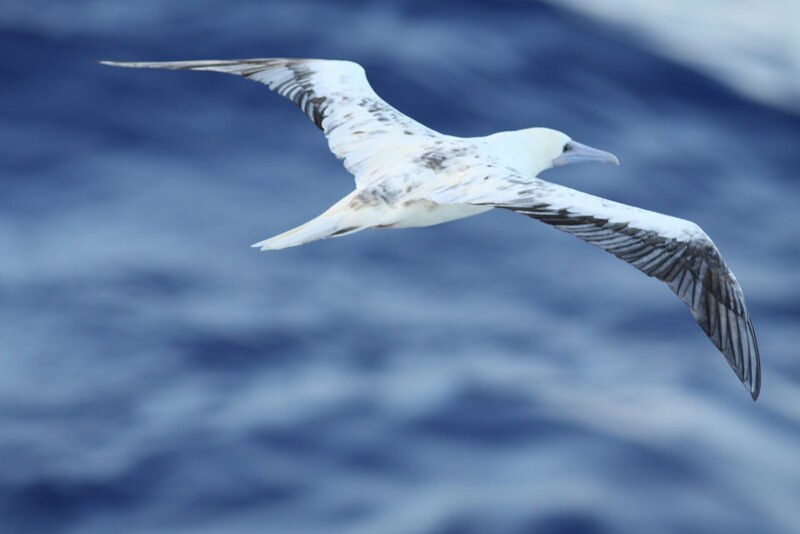 The birds that belong to this order are commonly called albatrosses, shearwaters, petrels, storm petrels and terns. 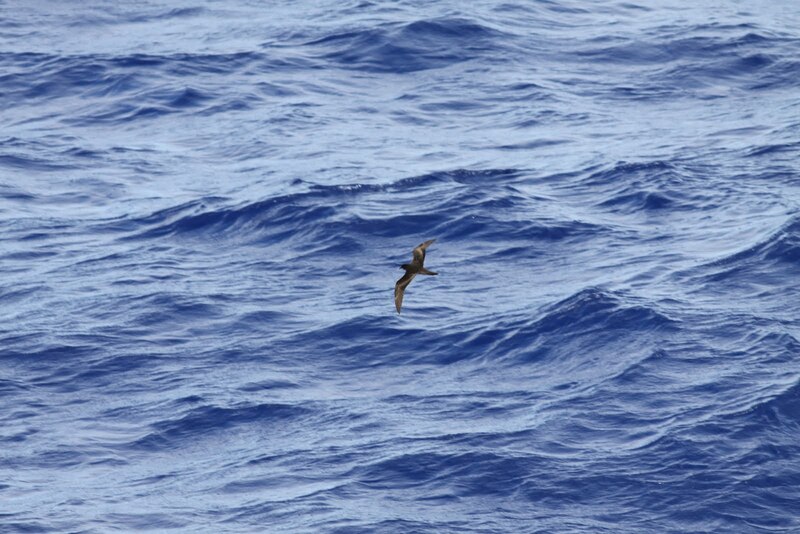 We saw many tubenosed birds such as the shearwaters; Newell and Wedgetail, the petrels; Bulwers and storm. Birds from the Pelecaniformes order are known for their four webbed toes. These birds include the boobies; red-footed the most common, brown and masked. The great frigatebird, also from this order was spotted, it is a very large bird related to the pelican. Birds from the Charadriiformes order consist of the gulls and terns. They are special unto themselves for example the Sooty Tern can live above the water for up to five years from the time it leaves the nest until it finds a breeding territory. The terns that were spotted were the noddy, brown, black, white (which is also called faerie) and the sooty tern. Overall seventeen different species of seabirds were identified on September 2, 2010. The birds’ activity is a sign to look for larger animals especially where flocks are seen. The two marine mammals that were identified were the steno and the Bryde’s (pronounced brutus) whale. Steno bredanesis is a species of dolphin. They are commonly called stenos, meaning “rough toothed” dolphin, and are common in many tropical waters. Almost nothing is known about its reproduction because it is very hard to follow at sea. Stenos have a very smooth beak and head with no melon shape for the forehead. The maximum length is 8’8” (2.65 m) and weight 350 lb. (160 kg). Its life span is 32 years. Brydes’s (pronounced Brutus) Whale is a baleen whale. It was named after John Bryde a Norwegian whaler in South Africa. Bryde’s Whale is large and sleek, dark grey above and grey white or pinkish below. They have modified teeth which form 250 – 370 baleen plates that are used to filter the water for small animals. The maximum length is 51 ft. (15.6 m) and weight 90,000 lb (40,000 kg). Its dorsal fin is tall and ragged on the trailing edge. No one knows what its life span is. My great “statemate” and avid birder, Dawn Breese. I haven’t been seasick! So far. The waves right now are larger than before, and as I sit I need to keep my stomach tight for balance. If it weren’t for the wonderful food, I could get in better shape in this month at sea. I did my job this morning at 5:00 am, it was beautiful out with bright stars and a calm sea. During the day I really enjoy sitting out on deck and just watching. I hope to spot an animal. It is very peaceful and the motion is comforting. I have been practicing with my camera. If I zoom it in 12x and then put it up the “Big Eyes” I can get some great pictures. Hopefully I’ll get some good shots of whales and dolphins. Most of the day was spent doing research on the animals we have seen. It was another great day at sea! 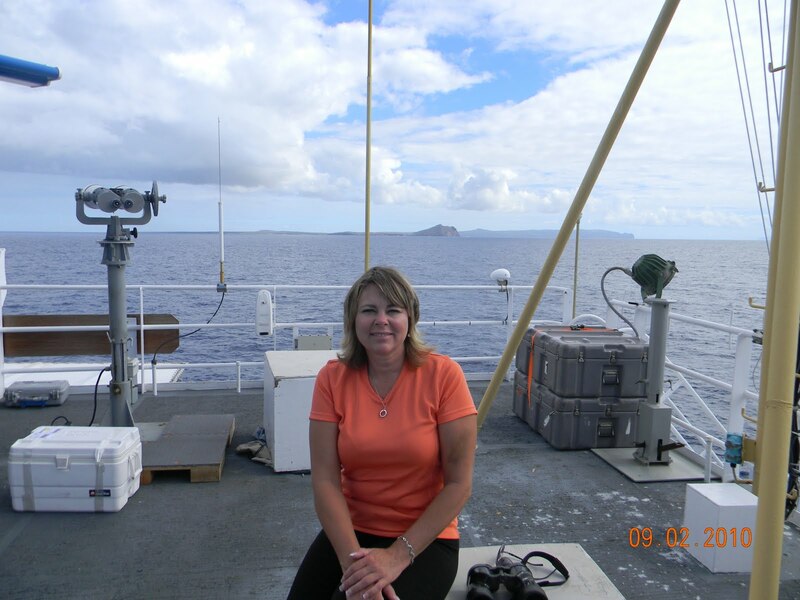 This entry was posted in 2010, Donna Knutson, NOAA Teacher at Sea and tagged big eyes, chlorophyll abundance., conductivity for measuring salinity, depth, Hawaii\, HICEAS, Oscar Elton Sette, Red footed booby, temperature. Bookmark the permalink.